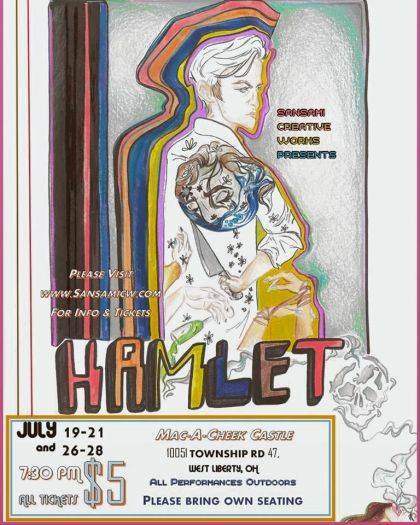 To reserve tickets in advance for “Hamlet,” visit www.SansamiCW.com/tickets. WEST LIBERTY – On Thursday, July 19, Sansami Creative Works, LLC. will open its production of William Shakespeare’s “Hamlet” at Mac-A-Cheek Castle, 10051 township Road 47, east of West Liberty. Called Shakespeare’s “greatest tragedy,” “Hamlet tells the story of the Prince of Denmark mourning his father’s death and his mother’s hasty marriage to his uncle, the new king, Claudius. When his best friend Horatio arrives from college to inform him of a supernatural presence, Hamlet’s grasp of reality is called into question, and he finds himself called to avenge his father’s death. Set in the 1970s, and presented in conjunction with the Mac-A-Cheek Foundation for the Humanities, Sansami’s production of “Hamlet” has been edited for local audience members and features a new ending. All tickets are $5, with performances beginning at 7:30 p.m. Patrons are encouraged to bring their own seating, as the performance takes place outside. To reserve tickets in advance, visit www.SansamiCW.com/tickets. In the event of severe weather, any evening’s performance may be delayed or cancelled. Individuals who reserve tickets in advance will be given warning of delays or cancellations at least an hour prior to curtain. Performances will be held July 19, 20 and 21, with a second weekend of performances July 26, 27 and 28. Featuring actors from across Champaign, Logan and Clark counties, “Hamlet” stars Sawyer A. Shafer (Hamlet), Alex Dye (Claudius), Christa Wolf (Gertrude), Monica Hartzler (Horatio), Dale Madison (Polonius), Logan Boggs (Laertes), Canaan Gray (Rosencrantz), Levi Logan (Marcellus), Rachael Chamberlin (Bernardo), and Allison Madison (Osric). The role of Ophelia will be played by Charissa Rabenstein the first weekend, with Keara Henry portraying the role the second weekend. The role of The Ghost will be played by Matthew S. Smith on July 19, 20 and 21, with Canaan Gray doubling as The Ghost/Rosencrantz on July 26, 27 and 28. Finally, Keara Henry will be portraying Guildenstern for the first weekend of performances, with Madison Roe as Guildenstern the second weekend. The “Tragedy of Hamlet” is Sansami’s 13th production in only five seasons. A semi-professional theatre company, Sansami strives to bring a variety of entertainment to the residents of Champaign, Logan and Clark counties. Sansami has previously performed sketch comedy shows and plays at LifeNet Fellowship Church, The Gloria Theatre, LoCo Art Spot, Tiger Hut Pizza (formerly Plank’s Pizza), Urbana University, and The Grove Community Center. This will be the second Sansami production to take place at Mac-A-Cheek Castle, with the first being The Great Gatsby in August 2016. For more information, visit www.SansamiCW.com. Submitted by Sansami Creative Works, LLC.